Proper poodle feeding and nutrition is an important aspect of your toy or miniature poodle’s overall health. Our dog food for poodles review can help you find the best option for your pup: we researched and reviewed best-selling dog foods for small breeds and poodles to help make the choice a little easier! First, take a look at the following features to consider when looking for a new dog food before chasing down our reviews. Food Type - The main dog food types include dry, wet, and raw foods, each with their own benefits and drawbacks. Dog Age - Puppies, adults, and senior dogs all have different nutritional needs that can be addressed with various kibble formulas. Package Size - One easy way to compare value across different brands is to use the package sizes for the price per pound. Dehydrated - Dehydrated dog food is a variation on raw dog food that has a longer shelf life while still providing holistic nutrition. Main Protein - Chicken is a common protein source in dog foods, but there are other options like lamb, fish, and more! Made In - We favored dog foods made in North America due to the strict regulations of ingredients and factories. Now that you’re ready to pamper your poodle, let’s dig into the reviews! Our top pick and budget pick summarize our overall favorites with all-natural, grain-free formulas packed with protein. But keep reading to find a variety of great options for your poodle! Go fetch! Our top pick for the best food for poodles is the Wellness CORE Grain-Free Small Breed formula. This brand makes it easy to find allergy-friendly alternatives with open ingredient lists and tons of options. Their Turkey & Chicken recipe starts off the right way with deboned turkey, turkey meal, and chicken meal as the first three ingredients. Made without corn, wheat, soy, or meat by-products, Wellness CORE is a great way to provide high-quality nutrition for your favorite little dog. The above-average 36% minimum crude protein level is ideal for active dogs--and it’s rare to find a lazy poodle! This recipe also contains probiotics, prebiotics, and fiber to support digestive health, as well as vitamins, minerals, antioxidants, and more to support everything else! 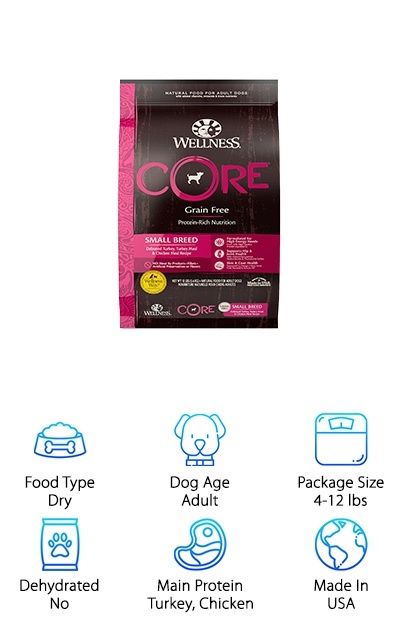 If you’re looking for an all-natural dog food packed with protein and complete nutrition, Wellness CORE might have what you’re looking for! If you’re looking for a natural miniature or toy poodle food that won’t break the bank, Whole Earth has it all! 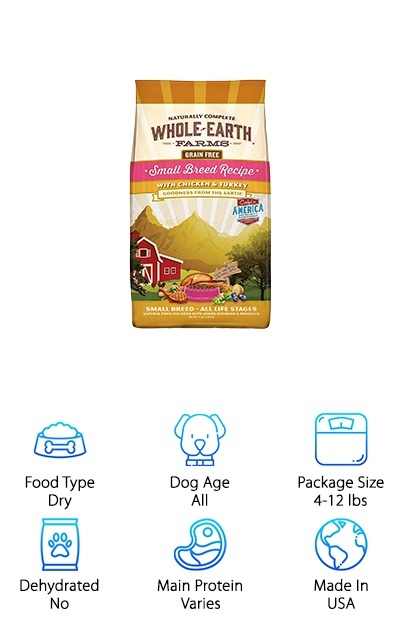 Made in the USA with natural ingredients, Whole Earth’s small breed recipes offer great value among natural dog foods. Choose from recipes like Chicken & Turkey, Salmon & Whitefish, and Pork, Beef & Lamb to provide unique high-quality protein sources for your dog. 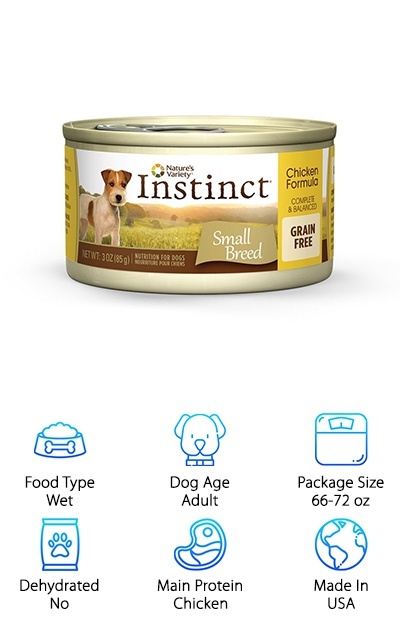 With no corn, wheat, soy, or animal by-products, your poodle receives high-quality nutrition in every bite. Potatoes, peas, and sweet potatoes provide complex carbohydrates, while fiber and probiotics encourage an active and healthy digestive system. This formula can be fed to puppies, adult dogs, and pregnant or nursing dogs as well! Vitamin and mineral supplements ensure your poodle is getting complete nutrition to support their health. The minimum protein content of 26% supports an active lifestyle, all in a nutritious holistic recipe! 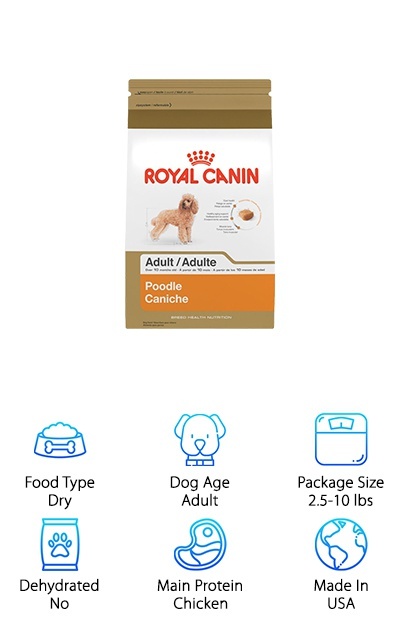 If you’re looking for the best dog food for poodles that’s tailor-made for the breed’s specific needs, Royal Canin Breed Health might be your new favorite kibble! 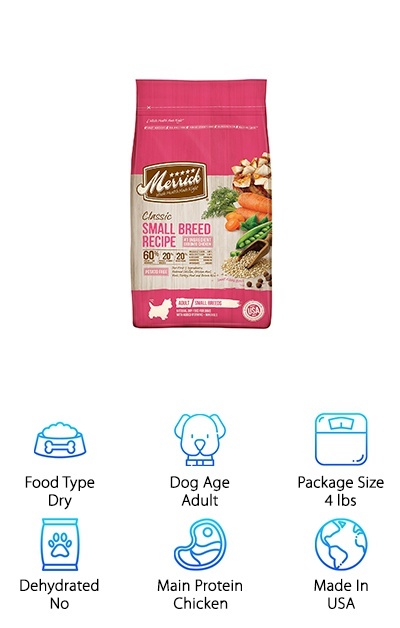 This dry dog food is made for toy and miniature poodles with their unique coat, intelligence, and other breed characteristics in mind. Omega-3 fatty acids EPA and DHA support that gorgeous wooly coat as well as healthy cerebral development, while optimized protein levels help to maintain lean muscle. Since poodles have a long life span of 12-15 years, this dog food also helps support healthy aging. Royal Canin also designed the kibble bits to be easy to pick up and chew based on the poodle’s long muzzle and scissor bite type. If you’re looking for complete, balanced nutrition for your poodle puppy, Royal Canin also offers a puppy food for poodles that we reviewed as well! Some dogs develop sensitivities or allergies to common dog food ingredients like corn and wheat, and even common protein sources like chicken or poultry! If you want to cut certain ingredients out of your poodle’s diet without sacrificing quality nutrition, Blue Buffalo Life Protection Formula for small adult dogs has a variety of great recipes made without corn, wheat, or soy. You can also cut down on chicken and poultry protein sources with their Fish & Brown Rice or Lamb & Brown Rice Recipes. Unique protein sources like turkey and whitefish add variety to your poodle’s diet. Combine that with complex carbohydrates from barley, oatmeal, and brown rice, and you’ve got a delicious dog food optimized for providing energy and easy digestion. Probiotics, fiber, and whole fruits and vegetables encourage optimal digestion and total nutrition, too! 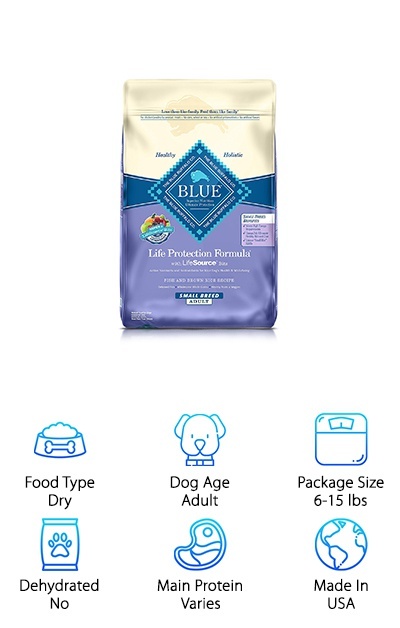 Blue Buffalo offers a great choice for natural dog food for poodles and other small breeds. Pedigree is a great source for basic, tasty kibble at a low price. Their small breed dry dog food comes in grilled steak or roasted chicken flavors in 3.5-pound or 16-pound bags. The kibble pieces consist of a variety of shapes and colors to keep your pup interested in their meal. Made in the USA with no artificial flavors or added sugar, this dry dog food provides complete nutrition for adult small breed dogs with a low to average activity level. Antioxidants, vitamins, and other nutrients support full-body health, including omega-6 fatty acids to nourish the skin and coat. Glucosamine, chondroitin, calcium, and D3 keep your pup’s joints, bones, and teeth strong, while biotin supports healthy nail and hair growth. You can help your poodle look their best without breaking the bank thanks to Pedigree! If you’re concerned about corn and wheat products, you may prefer a grain-free or other dog food alternative for your pup. Purina is a well-known dog food brand offering high-value kibble for dogs of all shapes, sizes, and ages. 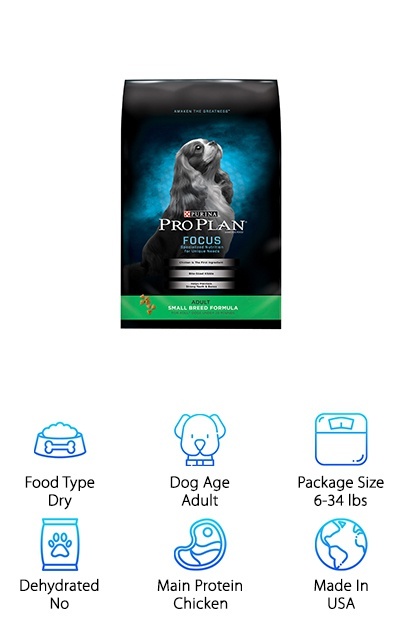 The Purina Focus Small Breed formula starts off strong with a high-protein formula with 29% minimum crude protein content and chicken as the first ingredient. 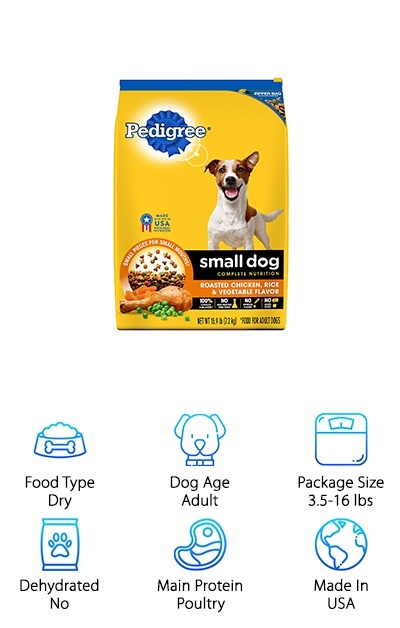 This dry dog food for small breeds under 20 pounds is perfect for dog parents that want the best dog food for toy poodles that won’t break the bank! The high-protein recipe supports active dogs, while prebiotic fiber from wheat bran keeps the digestive system running smoothly. Glucosamine, calcium, phosphorous, and more support healthy joints and strong teeth and bones. The small, crunchy kibble pieces are also rich in vitamin A and omega-6 fatty acids to keep your dog’s coat glossy and their skin free of flakes. Note that if you’re concerned about a grain intolerance or allergy, this formula does contain corn and wheat products. 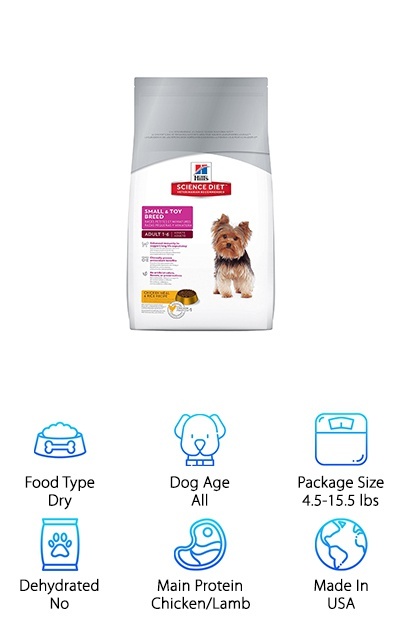 Hill’s Science Diet for Small Breeds offers dry kibble formulas for puppies, adults, mature adults, and seniors to cover all life stages for dogs under 25 pounds. The adult food line comes in lamb meal and chicken meal recipes with whole grain wheat and rice as the main sources of carbohydrates. This kibble is designed to be easy to chew and digest while providing complete nutrition for your miniature or toy poodle. Omega-6 fatty acids and vitamin E encourage hydrated skin and a shiny coat. The added antioxidants and vitamins provide clinically proven benefits to support the immune system and a long life. It’s all put together in a tasty kibble with no artificial colors, flavors, or preservatives. You can tailor your poodle’s diet to their age and their needs as a small breed dog. Plus, Hill’s Science Diet comes highly recommended by veterinarians! The Merrick Classic Small Breed dry dog food recipe provides high-quality nutrition for small breed dogs up to 30 pounds. This kibble starts off right with deboned chicken, chicken meal, peas, turkey meal, and brown rice as the first five ingredients. They pack a powerful punch full of top-quality protein and complex carbohydrates! Rice, barley, oatmeal, and quinoa provide whole grain energy sources instead of potatoes, corn, wheat, or soy products. These nutritious grains are easy to digest! Omega-3 and omega-6 fatty acids support skin and coat health, while glucosamine and chondroitin support the joints. This kibble also contains probiotics to support a happy and well-functioning digestive system. It’s a perfect pick for dog owners looking for a natural dry dog food with high-quality ingredients. It works especially well for active small breeds thanks to the above-average 30% protein content to help maintain lean muscle. Royal Canin offers breed-specific nutrition in their dry poodle food for toy or miniature poodle puppies from 8 weeks up to 10 months old. This dry kibble is tailored to the breed-specific needs of toy and miniature poodles with precise protein levels and omega-3 fatty acids to support the poodle’s continuous hair growth and coat health. Since poodles also have a long lifespan, this puppy kibble is designed to provide all of the nutrition they need to support healthy aging later in life. Probiotics and prebiotics help to support a puppy’s developing digestive system, and vitamins and antioxidants provide support to their immune system. Even the kibble’s size and shape is customized to the unique muzzle and bite type of the poodle to encourage chewing during meals. This Royal Canin kibble is a perfect choice if you want to pamper your puppy with a dog food made just for poodles! Nature’s Variety Instinct Wet Food is a great wet poodle food designed for the nutritional needs of small breed dogs. Your toy or miniature poodle will get a ton of delicious chicken flavor with real vegetables and added vitamins and minerals. This wet dog food is grain-free and gluten-free with no corn, wheat, or soy, plus it avoids artificial colors, flavors, or preservatives as well. It comes in 3-ounce and 5.5-ounce cans with easy-open tab lids. Antioxidants support the immune system, while omega fatty acids encourage healthy skin and a glossy coat. Probiotics help keep your poodle’s digestive system in tip-top shape, too! This dog food comes in a “loaf” form that’s easy to mix with dry food or serve alone as a tasty gourmet meal for your pup! If you want to provide a wet food for your dog with plenty of natural nutrition, Nature’s Variety Instinct knocks it out of the park.